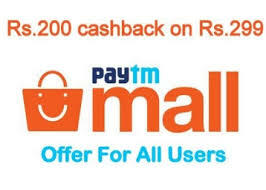 Have you ever got the chance to use Paytm Mall Get Rs 200 Cashback everymonth on Purchase of Rs 299 or more (All users). Paytm is offering an awesome offer on Shopping at Paytm Mall App, Get Flat Rs 200 Cashback on Shopping of Rs 299 or more. Maximum Cashback is Rs 200 per user. This promocode can be used only once per user per month. This promocode is valid for a Limited time only. So Hurry up and avail this offer now !! 1) First of all, Visit Paytm Mall website and Search for the product which you want to buy. 4) Apply Coupon:- EVERYMONTH to Get Rs 200 Cashback on Rs 299 or above for All Users. Note:- This Coupon will give you Rs 200 Cashback on all products. You can see Your Cashback details by Applying Coupon code. 6) Now Make the Payment using any of the Payment mode. You will get the Rs 200 Cashback to your Paytm wallet with 24 hours of order for prepaid orders and after 24 hours of delivery for Cash on delivery. 3. By using this promocode, customer can avail Flat Rs 200 Cashback. 5. This promocode is valid for a Limited time only. 11. Promo-code is not applicable for Cash on Delivery (COD) mode of payment. 12. If product purchased on EMI payment mode, Cash back gets credit post return policy. 13. If product comes under no return policy, Cash back gets credited post 7 days of delivery date.This cash back offer is being extended by One97 Communication. 14. Limited for using “Paytm Payments” on marketplace run and operated by Paytm E-Commerce Private Limited. It can be used to pay for anything on merchants accepting “Paytm payments” platform.